What if I told you that you were thinking about strategy all wrong; that strategy didn’t have to come in an endless PowerPoint deck compiled by consultants, marketing or finance. What if I told you that strategy could be simple. Real simple. So simple, that it could be confined to a few key bullet points. Simplification in today’s organizations is the strategy that has the greatest power to enable companies to stay lean, yet move fast in a world where the rate of technological change is outpacing human ability to adapt. 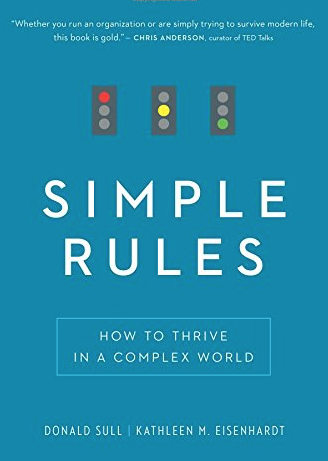 Simple Rules: How to Thrive in a Complex World by Donald Sull and Kathleen Eisenhardt is the antidote for surviving, adapting, and navigating a world of complexity and data overload. “Simple rules”, as Sull and Eisenhardt explain, can help us make better decisions when information is limited, vague, or overwhelming. These rules help us cut through the noise to find the salient points that enable us to pursue better processes or actions and ultimately make more sound choices. There is no better example of a function that has undergone change or is as impacted by complexity as the marketing organization, specifically in its necessity to become the wielders of data and digital transformation within a company. In fact, the pressure is on marketing to take complex information and drive insights and strategy for management and the commercial organization. The inability to synthesize and distill massive amounts of data accurately and quickly can drastically impact the organization negatively: sending our sales team after the wrong customer segments; incorrectly forecasting pipeline and organizational health; or sending the product team down the path of building a product their customers don’t want or need. Simple rules can help marketing and management teams gain focus by building clearly defined rules to enable faster and more accurate decision-making to drive increased profitability and intelligent insight, even with some of the most daunting and complex data sets. Limited – A handful of rules makes them easier to remember and act on. Bespoke – No situation requires the same rules. Everyone has their own set of rules, and differing mechanisms to remember them. Clear – Simple rules provide clear and specific guidance. Perhaps the most important point is how the authors explain drawing on these rule categories to form strategy. Strategy, after all, is not effective, the authors argue, if it does not influence day to day decisions and processes. Simple rules define for employees, managers, and leadership how to prioritize, process, and structure their actions allowing them to effectively make decisions across the organization whether in an Excel pivot table, operation control center, an assembly line, or a board meeting. Understand goals and objectives: As a leader, manager or employee… defining what the organization really cares about it step one. Is it increasing profitability, decreasing the downtime of the assets critical to your company’s operations, or improving employee satisfaction and work productivity? Before building simple rules, stakeholders need to understand what the high, medium and low-level goals are, areas needed to achieve that goal, and that there is buy in from all levels of the organization to comply with the goal. Gaining this will level-set what outcomes these rules are trying to achieve. Identifying the bottleneck – What is keeping you from achieving your goals? Understanding what pain points are impacting value creation, as well as what identifying those recurring decisions or processes that are causing the bottleneck pin points where rules and strategy are critical. Write the rules – Assemble a team of people impacted by the bottleneck. Craft the rules as a team, test with the team and in the real world, then refine the rules as needed. The authors explain that simple rules are not confined to one business or situation, business or personal, finance or marketing, but that anyone can use simple rules to improve all aspects of their lives and work. Creating rules is not easy, and often the first set of rules are weak and prone to failure, but the authors explain the process for building effective rules is iterative – like any good idea or business model, it shifts and changes as internal and external factors change, and as we learn more about what works and what doesn’t. Continuously reflecting on the performance and experience to improve the rules is critical to the process. Before becoming the first billionaires of the “shared economy,” Airbnb and its founders went through their own quest to better define and improve the simple rules that defined the model that enabled them to size and scale their business. Joe Gebba and Brian Chesky got the idea for Airbnb when they were looking to make some extra money by renting out their apartment during a design conference in San Francisco. They quickly booked out their apartment and realized there was a larger market than they originally thought. Looking to test their idea further, they started traveling to different conferences around the country looking to get hosts to open their homes during these busy times for money. They targeted both the South by Southwest conference (where they were met with little success) and the 2008 Democratic and Republican conventions (where they only fared marginally better). Doing experiential research: interviews, staying in living rooms, handing out fliers at coffee shops etc. These learnings helped them craft better rules: 1. Enter destination cities 2. Focus first on recruiting hosts 3. Share with hosts Airbnb’s hospitality principles (i.e. using high quality photos, clean apartments, proving localized insights and recommendations). Having these real-world experiences helped them to craft the simple rules that made Airbnb the perfect way to connect hosts and guests. As employees continue to stay relevant, and management looks to maintain or increase profitability and competitive advantage over the competition, the need for simplification is now more important and effective than ever. If organizations and people can get that right, it will allow them to win with precision and speed, no matter how complicated or volatile this world becomes.